Residents of Samaria communities destroyed during 2005 Disengagement demand government allow them to return to their former homes. Families from northern Samaria turned to the coalition leaders demanding a return to their communities, 13 years after they were expelled under the disengagement plan. In a letter sent Monday, the residents of the communities of Sa-Nur and Homesh turn to the leaders of the coalition factions, demanding that the bill be approved to end the disengagement from northern Samaria. "The settlements of northern Samaria are located in the very heart of the Land of Israel. The roads remain the same, the sidewalks are still painted blue and white, and even the gardens are still there. It is time to look directly at the faces of the families who were uprooted from their homes and say to them: We are sorry and we were wrong. The time has come to carry out the moral duty imposed on the government and erase the injustice from the law of the State of Israel. 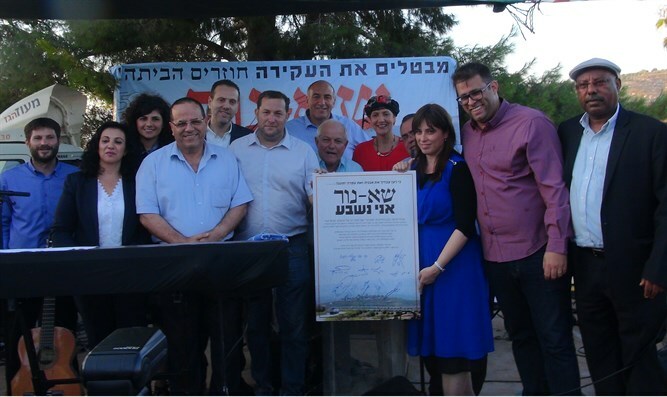 The time has come to cancel the Disengagement Law from northern Samaria. "This is a moral obligation towards the State of Israel being a Zionist state, the nation-state of the Jewish people," added the residents. "The pain of the expulsion and the longing for the home that we aspire to return to - did not stop for a moment. The four northern Samaria communities that were destroyed for nothing by the Israeli government are right here in the heart of the country. "We expect the Prime Minister of Israel, with whom we met on the subject, to rectify the injustice and to annul the Disengagement Law - and the sooner the better," the residents concluded.